Dr. A. 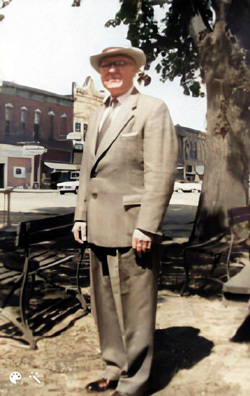 A. Johnson, son of Swedish immigrants, was born in 1893 and raised in Lake City, Minnesota. He attended dental college in Chicago, served as an Army Corpsman in Chicago during WWI. He married Dorothy Butler of Washburn and began his practice in St. Paul, MN. He and his family moved to Minonk in 1929, taking over the office of Dr. Newsome. His work included dental surgery as well as making dental plates. During the Depression he often traded dental work for farm products and services. He was a member of the School Board, a Presbyterian and a member of the American Legion. Because his office overlooked the bank, he was issued a shotgun and deputized during the '30s bank heist scares. He loved to travel, was an advocate of pasteurized milk and was a staunch Republican. He semi retired in 1960 after declining health and died in 1964. This information was provided by Dr. Johnson's son Albin Johnson.